Note: These plans consist of a booklet of 12 pages of text and many of Marya Butler's beautiful drawings on 8.5" x 11" pages. You have the option to choose either printed plans or an instant download PDF. To save $5 and postage costs choose the download option below. what kid wouldn't enjoy one of these? What kid wouldn't enjoy one of these! Heres a unique project that'll provide a wealth of smiles and might even become a family heirloom. Its loaded with personality and built as detailed in the plans it will last for generations and improve with age. After hundreds of projects its still one of our favorites. This is a heavy duty rocker that'll provide a real workout and when those little wranglers dismount they'll likely be all tuckered out and ready for bed. 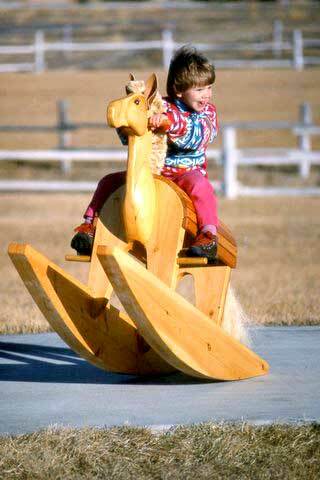 Its a rough and tumble hard-use toy that has been successfully corralled in day care centers, where it invites up to 2 riders at a time, and can become the most popular item in the playground. 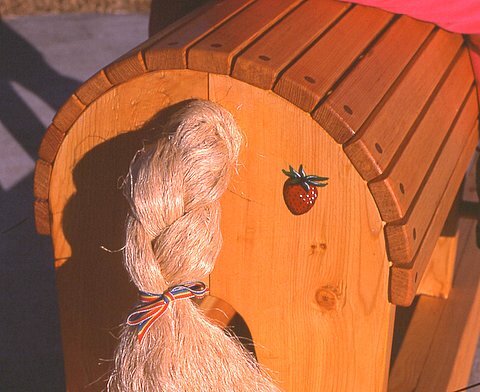 Its 60 to 70 pounds of solid laminated wood and can be sealed with varnish, oil or epoxy to provide weather protection. The rockers are big and heavy making it hard to tip over and providing a smooth motion--at full gallop it rides like a 53 Buick!! 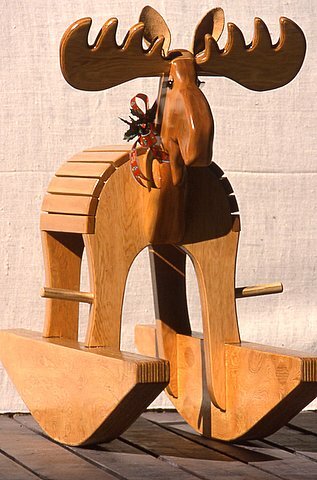 Stabled in our daughters bedroom the moose version, with those big antlers, did extra duty as a handy clothes rack, and stabled in the barn the horse version became a favorite saddle rack, and where we caught quite a few "grown-up" kids, with a wide grin, giving it a trial spin. It can be built of any available wood from select hardwood to lumberyard construction grades, and plywood can also be laminated for rockers and part of the body. 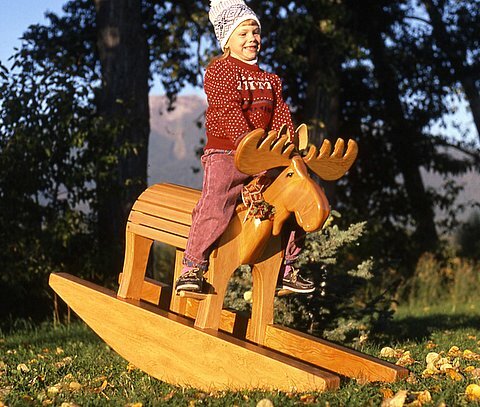 We recommend using yellow glue for the "house moose" version and epoxy for a tougher version exposed to extremes of weather. 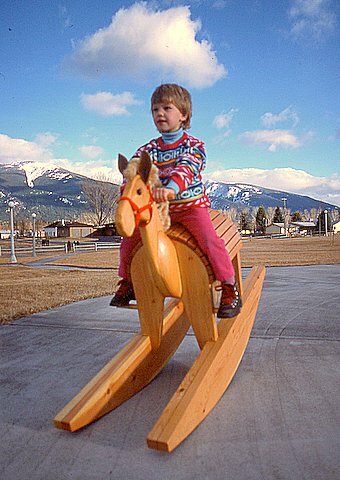 Build it to standard "playground" style with emphasis on durability, or assemble it like a piece of fine furniture with carefully matched grain, precisely fitted joints and delicately carved head and neck. 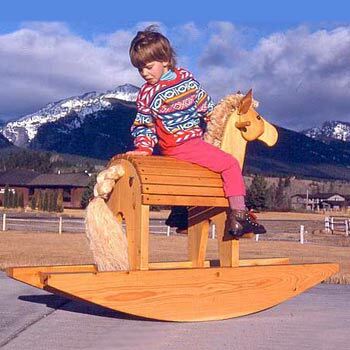 You can even shoe this critter---the rocker bottoms can be equipped with tacked on "quiet" strips of carpet which makes for a soothing silence even at full gallop--and you won't even wake grampa from his nap. 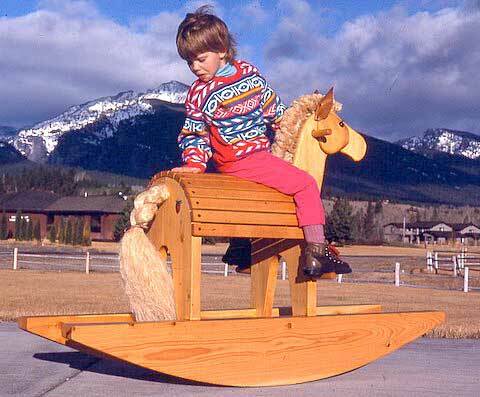 You can't buy a rocker like this, but you can build a version of your own. 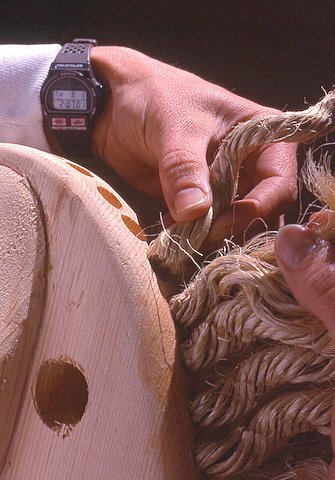 We'll show you how we laminated and hand carved ours and you take it from there. 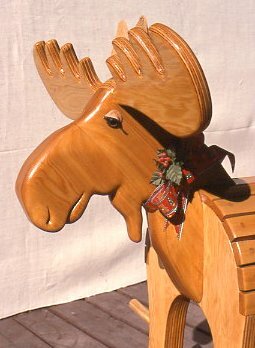 Amateur and profesional woodworkers alike will appreciate the nicely drawn plans and the many options to customize. There is even a section on making and attaching the eyes and eyelids plus directions on making a mane and tail.